Linholm and the talented staff at Highland Tap and Burger (HTB) were diligent and thoughtful in their pairings with all the beers. They also brought out some new culinary treats to the Crafty Ladies. First up for the night was the Mirror Pond Pale Ale, the number one seller for Deschutes. It’s a full-bodied hop-forward beer brewed with whole Cascade and Centennial hops. Linholm shared with us that Deschutes is one of two breweries, (Sierra Nevada being the other), in the country that’s using whole hops for brewing. The Mirror Pond paired with a delicious crostini of fig balsamic jam, coppa (cured salami), and a double cream brie. The new seasonal, Chain Breaker White IPA was next on the menu. I recently tried this beer at Trinity Brewing in Colorado Springs. I definitely like the different variation Deschutes is taking on wheat beer: wheat and pilsner malts, Cascade and Citra hops, and Belgian yeast. The Chain Breaker stemmed from a collaboration with Boulevard Brewing Company out of Kansas City, best known for their Tank 7 Farmhouse Ale. When sipping on the Chain Breaker you can definitely taste the influence of Boulevard, most notable because of the heavy Belgian yeast presence. Right now in Colorado, Chain Breaker is only available on tap, so check your favorite beer bar to see if they’re stocked up (Highland Tap and Burger has it!). The chefs at HTB cleverly paired this beer with a citrus-forward quinoa salad featuring avocado and a roasted orange vinaigrette. 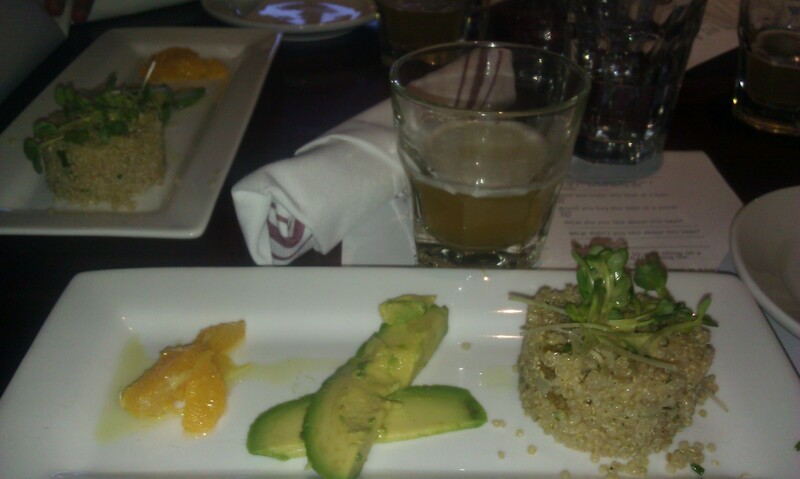 The citrus in the quinoa and vinaigrette provided a great compliment to the wheat beer, (no orange needed in this glass). The Red Chair Northwest Pale Ale (NWPA) has been a sought after spring seasonal for a few years now. If you’re curious what a Northwest Pale Ale (NWPA) is, don’t stress too much. For the most part, NWPA is a term that the Deschutes brewers coined for this beer. The Red Chair NWPA offers an incredible malty sweetness, yet is balanced nicely with citrus hops. Smartly paired with a wild mushroom crostini featuring garlic aioli, packing a creaminess that made a perfect match for the malty brew. As the Thirsty German and I were chatting about the beer, we decided it had several similarities to an ESB. Then Linholm shared that this beer won the gold medal at the World Beer Cup as an English Style Pale Ale. Next in our tasting flight, the go-to Inversion IPA, an 80 IBU and 6.8% ABV hop-forward beer and 2011 World Beer Award winner for America’s Best IPA. Whole Centennial and Cascade hops appear again in this beer balanced by tart citrus notes from Carastan and crystal malts. 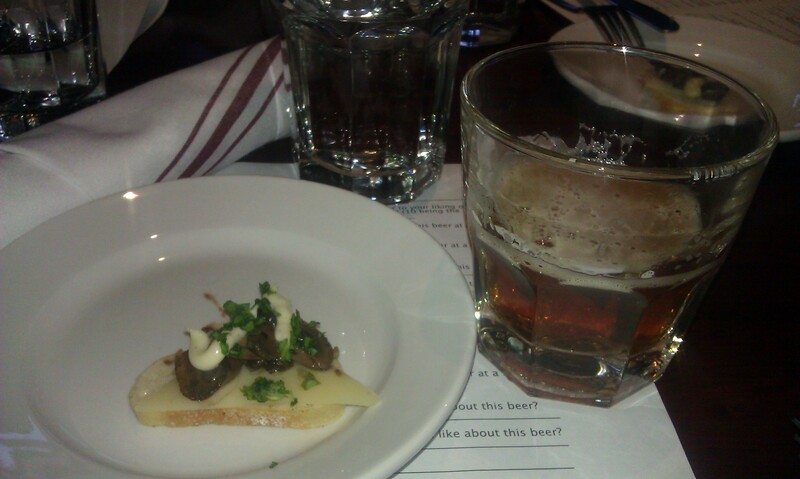 Strong creamy blue cheese and sweet candied almonds paired great with this high-ranking IPA. 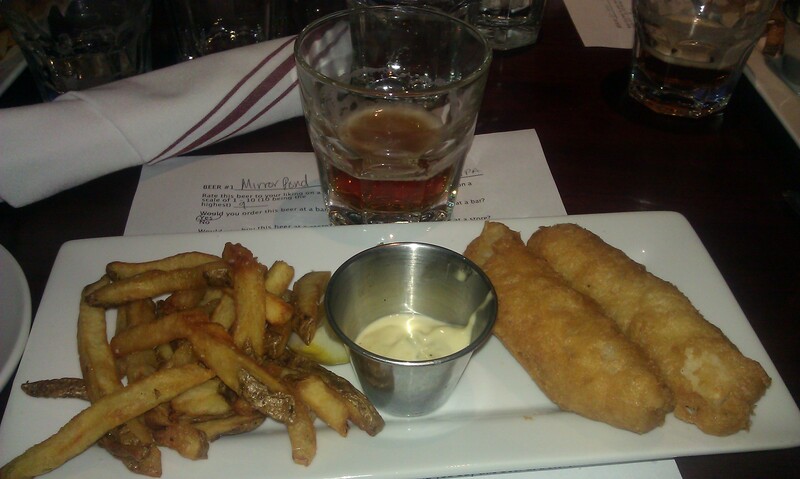 The Hop Henge Experimental IPA served alongside a healthy portion of perfectly fried fish and chips made this course the highlight of the night. The 95 IBU beer is part of the Bond Street Series at Deschutes and is on its way out of stores while you read this as another brew in the series, Hop in the Dark, will make an appearance next week. Word on the street? There are a few bombers left at Argonaut, so if you spot one, snag it, because there aren’t many left in Colorado. 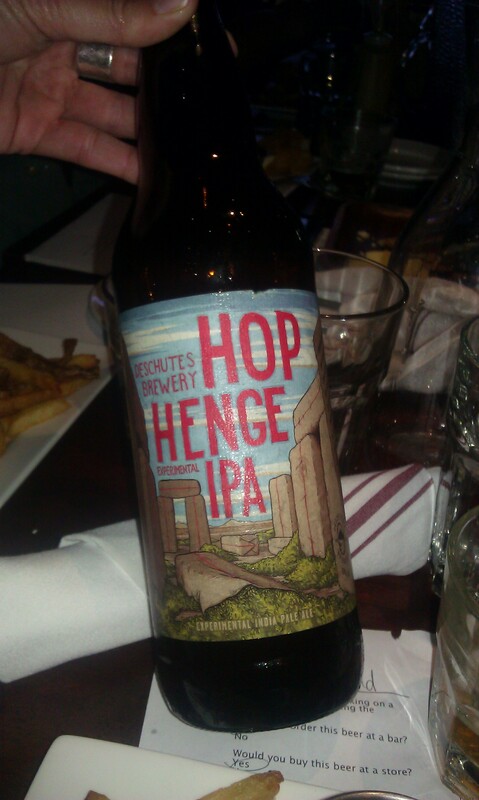 The Hop Henge is a balanced, but floral, hop bomb. Drinking it brought memories of Firestone Walker’s Double Jack and Breckenridge’s 471 IPA. Rounding out the evening was Deschutes’ flagship Black Butte Porter, a delicious dark beer boasting bold coffee and chocolate notes. In the olden days, when I only drank porters and stouts, (such a time did exist for Lady Lupulin), this was always my go-to beer. And I’ll still order a Black Butte any day I’m in the mood for an old malty friend. Happy Cakes’ mini carrot cake cupcakes brought a nice sweet bite to end the evening. 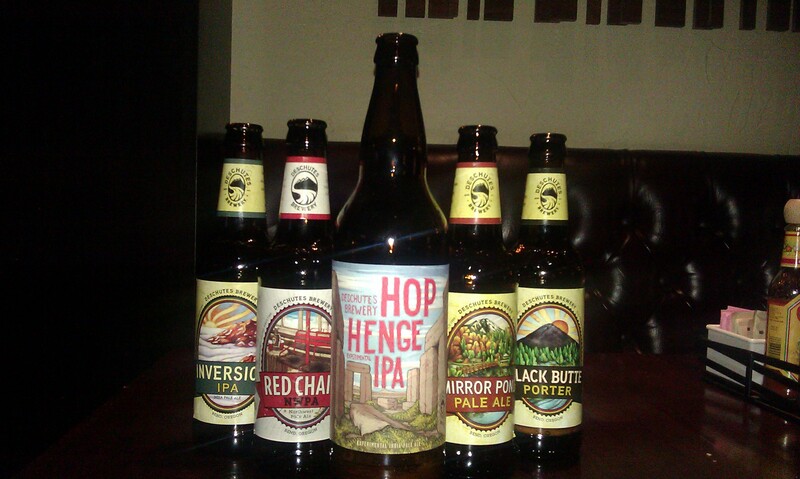 Thank you Renee Lindholm, Deschutes Brewery, Katie and Highland Tap and Burger for a great evening. I’m not sure who’s up next, but I know it will be good. Don’t forget to check out the events during Colorado Beer Week starting on Saturday, May 12th. Highland Tap and Burger will be hosting a Crafty Ladies four course beer dinner with Firestone Walker and Left Hand Brewing (male or female partners are welcome) $45 per person. 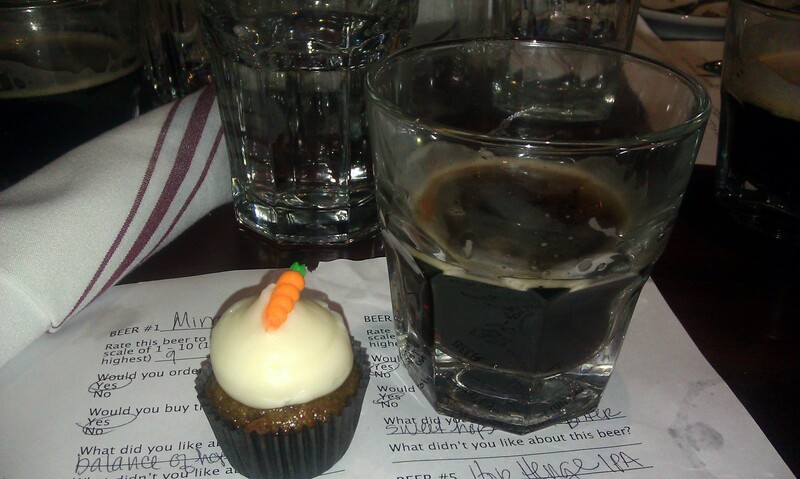 This entry was posted in Craft Beer Adventures, Food and Beer Pairing, Women and Beer and tagged beer and food pairing, Boulevard Brewing, Colorado Beer Week, Crafty Ladies, Deschutes Brewery, Highland Tap and Burger, women and beer.